We confirmed that the chilling, first-person psychological adventure game The Town of Light will be released on June 6, 2017 in physical and digital formats! Featuring numerous improvements and new supporting content for its console debut, The Town of Light is coming to the PlayStation 4, Xbox One and Windows PC. To celebrate, we’ve released a new live action trailer, The Shadow of Memories – shot in 4K, featuring the heart-rending track ‘I Will Find You’ from Icelandic singer-songwriter Sóley. Set in the Volterra Psychiatric Asylum – a former mental treatment facility based in Tuscany, Italy – The Town of Light is based on extensive research and inspired by first-hand accounts of the asylum’s patients. This new release of The Town of Light will offer a host of new puzzles, new story-supporting content, reworked voiceover dialogue, additional interactive elements and a huge graphical and UI overhaul that aims to deliver a more polished and immersive experience for its console debut and enhanced Windows PC release. Played through the fictional eyes of Renée, a 16-year-old girl who suffers from the symptoms of mental illness, players must search for answers to the many questions from her past while exploring and uncovering the place where she spent most of her youth. What happens next is a dark and emotional journey where the lines of interactive entertainment, storytelling and reality blur. The new trailer was created to show the reality of the Asylum. Whilst Renée is a work of fiction, created by writer Luca Dalcò, the stories, the history, is all real. We hope that by watching the new live trailer, you’ll feel this connection to reality more than ever. This isn’t a jump scare game, this is a story. An adventure through a very difficult subject, one that isn’t talked about in this industry. Games are traditionally a medium used to switch off from the world, to escape. Rarely are games used to tell a real story, to highlight truth and question humanity. This is something Luca and his team from LKA are very passionate about. Creating the video was a great adventure for the team. Everything was shot in 4K in just two days, using a Sony alpha 6300, with the support of a Yuneec drone. Thanks to the cooperation of the council in Volterra and Pisa, the team were lucky enough to be able to film in the real locations where the game is set. Between the crumbling pavilions of the former psychiatric hospital at Volterra and the museum there (which is ordinarily closed to the public), they were even able to include original objects and clothing from the asylum, which you can see surround the actors within the scenes. 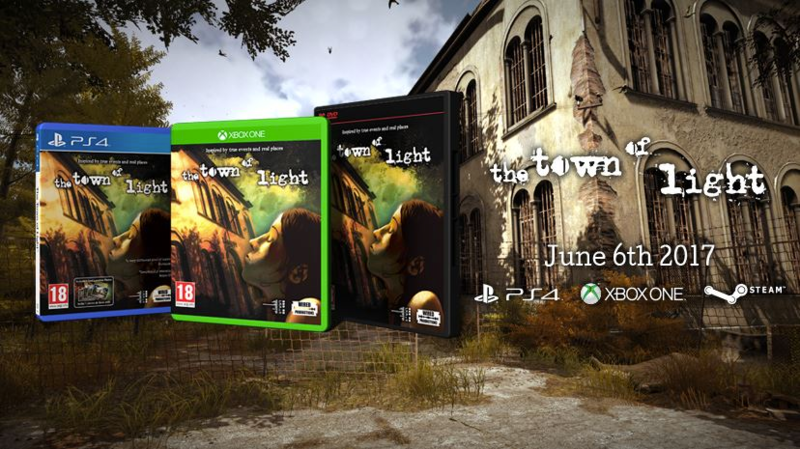 We’ll be sharing more news in the coming weeks leading up to the June 6th release of The Town of Light. Please make sure you follow the official Facebook and Twitter pages!